Dustin Schilling in the design lab corridor on campus. 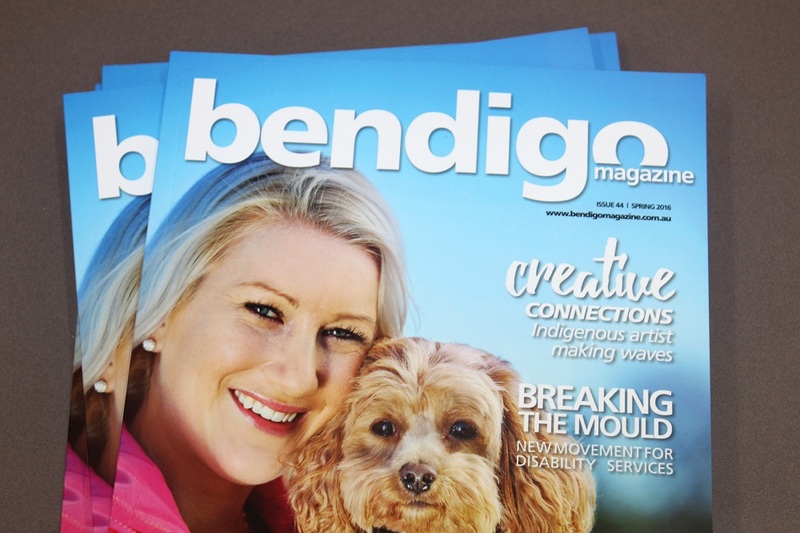 The much-loved Bendigo Magazine hit the shelves this week. To readers it’s business as usual for the 44th edition, but to one local the spring 2016 mag will forever be known as issue one. It’s the first publication under the ownership of Bendigo La Trobe alumnus Dustin Schilling. Not that he’s a stranger to the glossy pages. Dustin began working as creative director on the magazine when it was in its infancy, shortly after he graduated in 2005 with a Bachelor of Graphic Design. He says he’s spent the past ten years largely stuck behind the Apple Mac, designing the pages, but he’s quickly getting a handle on all facets of the business, including delivery. 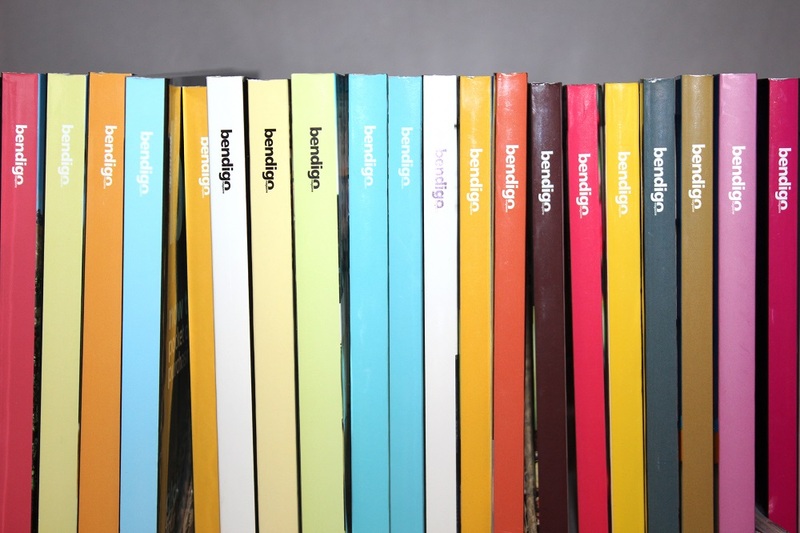 Bendigo Magazine has been a colourful part of the city since 2005. 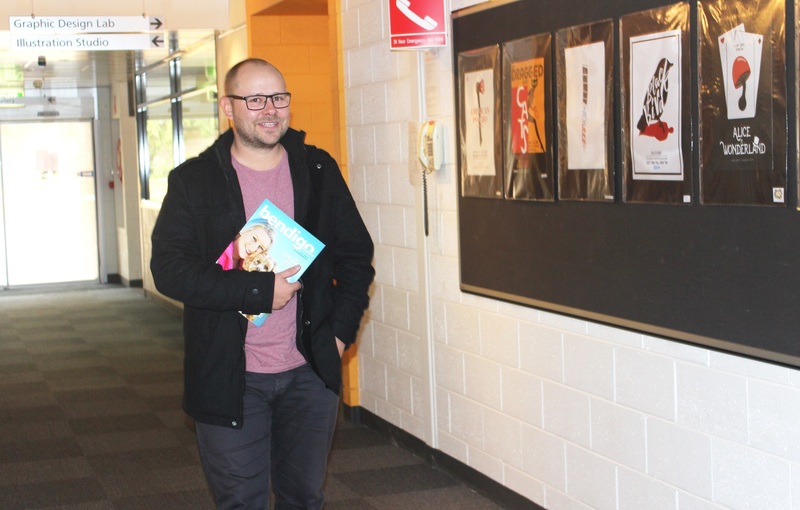 Dustin was on the Bendigo campus this week to drop off a box of magazines. He says it was the first time he’d been back since graduating. Dustin’s break into publishing began right here, via a uni assignment. As a student he designed a website for local business Devine Rugs and Décor for a class assignment. The business owner was a family friend. “She also happened to be one of the first advertisers who signed up for Bendigo Magazine and she wanted to replicate the design of her website in the magazine ad,” he says. That small thread was Dustin’s link to meeting magazine founder Amy Doak – who studied business and marketing at La Trobe, and lectured here before pursuing publishing. Dustin began doing the odd freelance job for Amy before she offered him a full-time role designing the magazine. Between that and graduating he’d spent six months working in Melbourne, designing packaging for printer toners. Dustin’s former lecturer Geoff Hocking writes and illustrates a regular magazine column. Dustin says working at the magazine was a great way to get to know the city; its businesses, social scenes and connections. Even his past lecturers. Former graphic design lecturer, artist and author Geoff Hocking has been a long-time columnist. “Geoff’s a pretty interesting person. He probably needs a story written on himself actually,” Dustin says. He’ll also be giving the magazine’s online presence some attention, with plans to share video stories to compliment the print edition; those lovely fragrant tactile pages. See the latest issue for yourself in newsagencies around the city. 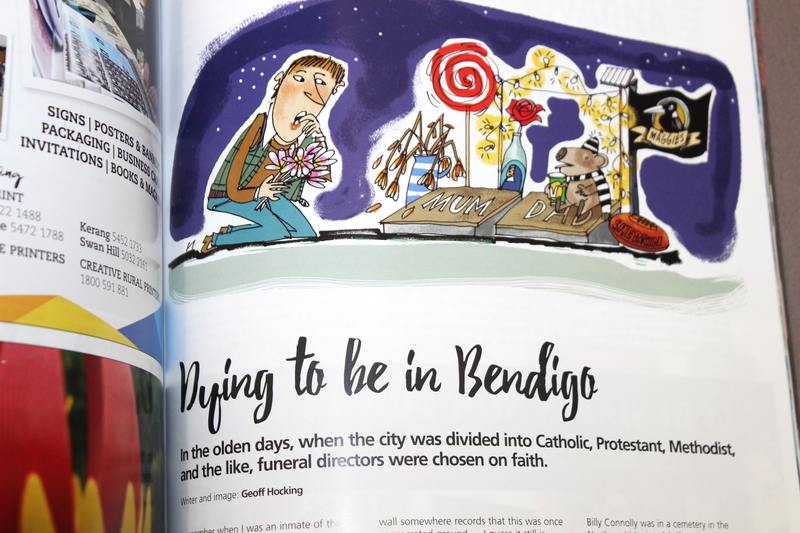 The spring 2016 issue of Bendigo Magazine is out now.